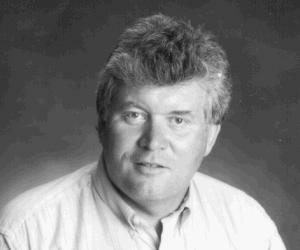 A picture of Doug Purvis taken in the early 1990s. Douglas D. Purvis was a remarkable colleague and friend who died tragically in January of 1993 after an accident that occurred over the Christmas vacation. In Doug's memory, the Economics Department has established the Douglas Purvis Professorship in Economics. The first holder of this professorship, Gregor Smith, was appointed effective July, 2000. Doug Purvis was born in Calgary. He received his B.A. from the University of Victoria and his M.A. from the University of Western Ontario. He obtained his Ph.D. from the University of Chicago under the tutelage of two distinguished Canadian economists, Harry Johnson and Robert Mundell. In 1971, Doug arrived at Queen's, where he quickly established himself as one of the leading scholars in the area of open-economy macroeconomics. This theme remained throughout his career. It later surfaced in his support for free trade and flexible exchange rates and, more generally, in his appreciation of the full implications of increasing globalization for a small open economy like Canada's. Doug rightly achieved an international reputation in this area, one recognition of which was his commission by the award committee for the Nobel Prize in economics to prepare the official record of James Tobin's contributions to economic science when Tobin won the 1981 Nobel Prize. In the early 1980s, as he was evolving from theorist to policy practitioner, Doug developed a second theme, a concern for the implications of an emerging government debt and deficit burden. In a series of papers, some jointly with Neil Bruce, Doug examined the longer-term consequences of structural fiscal deficits and coined the phrase "the prudent deficit". This was not the standard case against deficits, for despite his Chicago training, Doug remained a Keynesian and an ardent advocate of the case for fiscal stabilization. What worried him was that the debt and deficit buildup during non-recessionary years would inevitably remove fiscal stabilization as a tool in more troubled times. A more recent theme was the economics of the Canadian constitution. Doug played a substantial scholarly and advocacy role in ensuring that the issue of preserving and enhancing Canada's internal economic union had a prominent place in the constitutional debate. He was not a decentralist, but to the extent that further decentralization was inevitable in some areas, he recognized that, just as there was a pressing need for international economic co-ordination, there was also an internal need to manage the policy interdependencies between Canada's different levels of government. Doug spent his entire professional career at Queen's and contributed substantially to its reputation for serious economic scholarship and training. The Queen's Economics Department plays a unique role in Canada. Not only has it served for years as a conduit between academia and the federal government, but it is arguably the most influential graduate department in the country. During the 1970s, Doug was pivotal in building the doctoral and masters programs. He personally supervised many students, and some of the finest macroeconomists in the country today -- in academia, government and the private sector -- were his doctoral students. Within Queen's, Doug was an institution. His counsel was actively sought on major decisions affecting the University and he assumed a significant number of administrative tasks over the years. He was Head of the Economics Department from 1986 until his death, and he was the Director of the John Deutsch Institute for the Study of Economic Policy from 1984 to 1987 and from 1990 until his death. But it you could ask Doug, he would say that what was most important to him was teaching and his students. He loved to talk about ideas in economics and about the great debates that have engaged the profession over the years: the role of markets versus central planning, Keynesians versus Monetarists, rules versus discretion, and international policy co-ordination versus policy independence. Generations of Queen's students were exposed to the Purvis view of economic science, the economy and the world, along with substantial doses of Purvis witticisms. His students were as loyal to him as he was to them. Doug Purvis followed in the tradition of the close Queen's/Ottawa relationship established by predecessors like Clifford Clark, W. A. Mackintosh, and John Deutsch. In the early 1980s, Doug was a member of the Finance Department's economic advisory panel, and later -- from 1985 to 1987 -- held the position of Clifford Clark visiting economist in the finance department. Later, he was actively involved in the constitutional process both within the system, as a consultant to the Federal-Provincial Relations Office and to the Joint Parliamentary Committee, and outside it as an organizer of and contributor to several academic conferences on the constitution. One of the abiding interests of Doug Purvis was the application of economic analysis to important issues of public policy. Next to the department itself, his greatest professional commitment was to the John Deutsch Institute for the Study of Economic Policy, or JDI. During those years, the JDI became one of the most important outlets for high-level public policy debate in Canada. The purpose of the Purvis Professorship is to make it possible for Queen's to hire and/or retain an economist of the highest calibre who is committed to serious study of issues related to economic policy. The Professorship provides a (currently rather modest) salary supplement and may also provide funds to support research and graduate assistants. It honours Doug Purvis in a way that he would have appreciated, in view of his strong commitment to both the Queen's Economics Department and the application of economics to policy issues. The first holder of the Professorship is Gregor Smith. Although the University is no longer actively raising funds for the Purvis Professorship, the Economics Department continues to do so. The amount of money in the endowment fund is considerably less than what we need. In fact, it is about two thirds of the minimum amount currently required to establish a professorship at Queen's. Doug's friends and former students continue to contribute to the fund, and further gifts would be extremely welcome. If you would like to contribute to the Purvis Professorship, or you would like to help us raise funds for this project, please do not hesitate to contact us. There are several ways to do so. James MacKinnon is the Head of the Department. His phone number is 613 533-2293, and his e-mail address is jgm@econ.queensu.ca. Frank Milne is the Department's Fundraising Chair. His phone number is 613 533-6494, and his e-mail address is milnef@econ.queensu.ca. Patty McHenry is the Director of Major Gifts in the Department of Development. Her phone number is 613 533-6000, ext. 74001, and her e-mail address is patty.mchenry@queensu.ca.